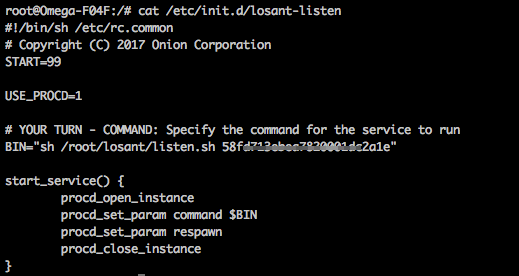 Last week, we learned how to receive commands from the Losant Cloud Platform and pipe them into a script so they can be parsed and executed. This week we’ll be using the OpenWRT/LEDE init.d system to run last week’s scripts as a service at boot-time. That means that as soon as your Omega boots, it will be ready to receive and act on commands from Losant with no intervention required from your end. The best part is that if your program crashes, the Linux system will start it back up again since it’s a registered service. This opens up a whole world of IoT possibilities when combined with the flexibility and power of Losant’s workflows. For this tip, we’ll create an init.d service with a shell script, configure it to run the command we want, and then set it up to launch the service during the Omega’s boot sequence. We’re assuming that you’ve done all of last week’s steps with everything that follows! To start, we’ll need an intermediary, wrapper script; all it will do is accept our Losant Device ID as an argument and call the script from above. We have this wrapper script since we’re interested in creating a service from a command that includes a pipe character. It will be downloaded to the /root/losant directory. Ok, let’s move on to the main event: the script that implements an init.d service! To save you some typing, we’ve made a template for a basic init.d service, you can check it out on GitHub. In a nutshell, it registers the command you would like to run as a service with procd, the main process management system in OpenWRT/LEDE. This will download the template and put it into a file called /etc/init.d/losant-listen. We’ll need to modify it so that the command it registers with procd is the listen.sh script we previously downloaded. If you don’t already know it from last week, you’ll first need to grab your Losant Device ID; either online from Losant or by looking at the /etc/mosquitto/mosquitto.conf file on your Omega, it will be the hex digits on the line starting with remote_clientid. The RGB LED on your Dock will now be red! And that’s it! Now whenever you power on your Omega, you can rest assured that when the Omega’s LED stops blinking, it’s ready for action and listening for Losant commands without any input required from you (as long as you have an internet connection). Learning how to create init.d services is a great skill to have in your Omega repertoire and lends itself to creating truly automated systems and devices. You can use this week’s tip, as is, to setup your Omega to automatically listen for commands from Losant. This is handy if you’ve gone ahead and implemented handlers for your very own device commands based on last week’s tip. As a bonus, now you know how to use the init.d system and have a template for creating your very own services. This is very useful for when you write programs that you want to be launched automatically when the Omega boots and then continuously run while the Omega is powered on. We’re sure you makers out there will find a ton of cool things to make using this system!